There are so many moments of purity in Kingdom Hearts 3 – of happiness and beauty, harmonising like a catchy Alan Menkin duet, intent on pulling at your heartstrings or simply allowing you to feel overwhelmingly moved by how special it is. It’s something that, after hours of playing, you try so desperately to cling to when Tetsuya Nomura’s convoluted and downright ridiculous plot continues to fall apart at the seams. Even as someone who’s followed Sora and Co for years, I couldn’t help but facepalm for the hundredth time when yet another alternate version of a character pops up and tries to detail what is actually happening, or the forced idea of hearts being responsible for every intricate and seemingly nonsensical story beat gets launched at you faster than Baymax’s armoured glove. Despite the plot losing its path the further you progress, there’s no denying this is a wonderful game at times. 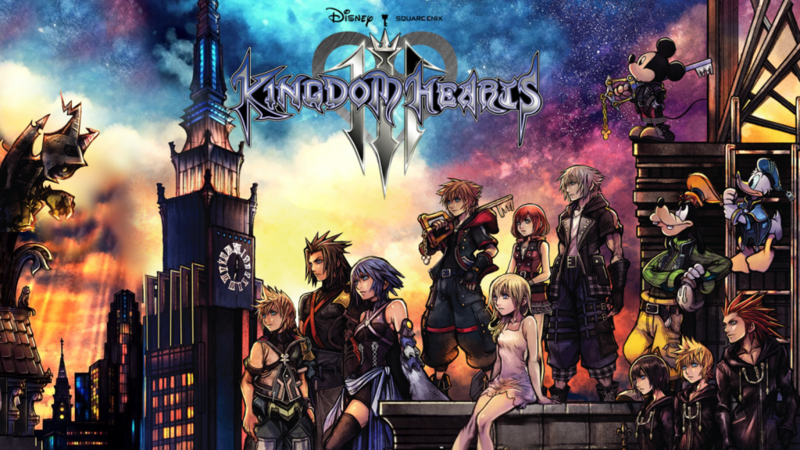 Sora and the Seven Guardians of Light must stop Xehanort once and for all, and to do that you must travel through various Disney worlds and defeat both him, Organisation XIII, and countless enemies in the process. The combat is remarkable, and given the amount of options at your disposal, Kingdom Hearts 3 manages to keep the fighting as its strongest asset right up until the final battle. To call it Hack-and-Slash would be a disservice. There’s so much crammed into the controls that it all seems overwhelming at first, but with the wealth of enemies populating the game you pick it up in no time. Whenever you finish a world, you’ll acquire a themed Keyblade that has a particular focus on Strength or Magic, and when using it in battle you’ll reach three stages (called Form Changing) to get the most use out of it. My favourite is Wheel of Fate – the one from the Pirates of the Caribbean themed world – as it deals huge amounts of damage and has great range when reaching its final form. Using a Keyblade builds its power, and once it reaches its max, a prompt will appear in the bottom left corner of the screen letting you know its power is ready. Activating it sets off a fun little animation, followed by an increase of attack power and some fancy visuals. Continue using it and its final stage will activate, allowing an even stronger assault on your enemies. Each weapon has specific abilities, and you can equip up to three at any one time. Another wonderful feature in combat is the Attraction Flow. 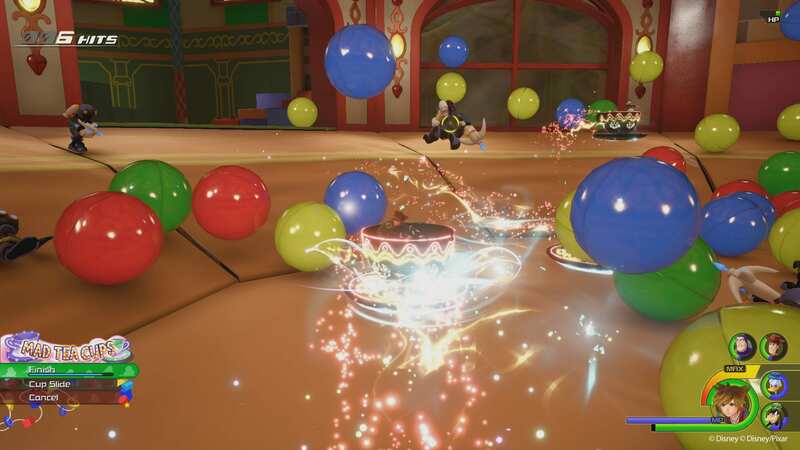 From time to time, a green circle will surround an enemy, and if you manage to strike them before it disappears, you’ll acquire a power-up that lets you call upon one of the many Disneyland attractions to help clear out the Heartless. They’re all randomised, but each one does damage in different ways, and all are stunning, illuminated, and filled with grandeur that give each battle a unique path to victory. 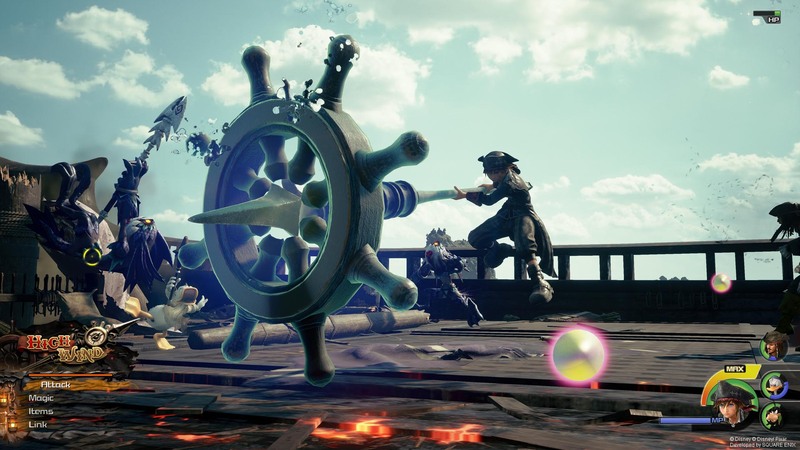 The Pirate Ship swings from left to right, the Water Rapids fly all over the screen as do the Tea Cups, and the Blaster Blaze lets you jump behind a gun and fire at all the enemies on screen. My favourite, however, was the Runaway Train, and it comes in super handy on the path to the final few areas. Both Donald and Goofy – your trusty sidekicks – will build up powers when tangling with Nobodies, Unversed, or Heartless, and depending on your world, one of its characters will join you in combat too. For example, when in The Kingdom of Corona, Rapunzel will use her hair to attack, or in San Fransokyo, Baymax will let Sora jump on his back and you’ll be able to fly around and shoot lasers at the enemies. All of their special attacks build in the same way your Keyblade does, and when they’ve built up it’ll appear in the same place as the Keyblade attacks do. Sometimes you’ll have plenty of special attacks all ready to be used, as well as any Attraction Flows you’ve unlocked. You get 30 seconds to use them all and it’s important to not miss out as they can be great tools to break up combat and give your poor right thumb a bit of a rest. Flowmotion encourages you to use the environment to launch into enemies, and by dashing into a nearby tree, pillar, or lamppost, you can spin around them and launch yourself hard into an enemy. Athletic Flow lets you utilize the environment to fly to unreachable heights or fire a chain of attacks at tougher enemies, and the Links system is back, allowing you to call upon the likes of Wreck-It Ralph, Stitch, and Ariel for a bit of extra diversity and support. Magic is also a key form of attack, and the more spells you use, the easier taking down some of the tougher enemies becomes. You’ll fight a lot of different bosses, and they all have different attack patterns to deal with, so its welcoming to know you’ve got more tricks up your sleeve than Master Yen Sid’s. There’s a great fluidity to combat, and though it can be rather chaotic at times, the satisfaction of mixing it all together becomes a euphoric treat. It can be made much easier when locking onto an enemy, but it’s also tricky to lock on to the enemy you want to, and if you’re fighting a boss that disappears from the screen during a battle it becomes a challenge to find him again and continue the process once more. Camera angles can also become a problem when there’re so many enemies populating the screen, and if you’re trying to target the boss it does become more of a chore. Perhaps the biggest dud when it comes to gameplay is the Gummi Ship. If these sections were completely removed I’d be much happier, because the times you have to embark on your next voyage in the small ship are always met with a groan. It’s not that it’s particularly bad, but there’s so much more to do, especially if you bump into an enemy ship that needs to be taken out. These sequences are dull, and completely rip you out of the fun found throughout the various worlds because of the monotonous shooting. When you just want to travel from A-to-B, they can get in the way, as do the other minigame battles that intervene from time to time. 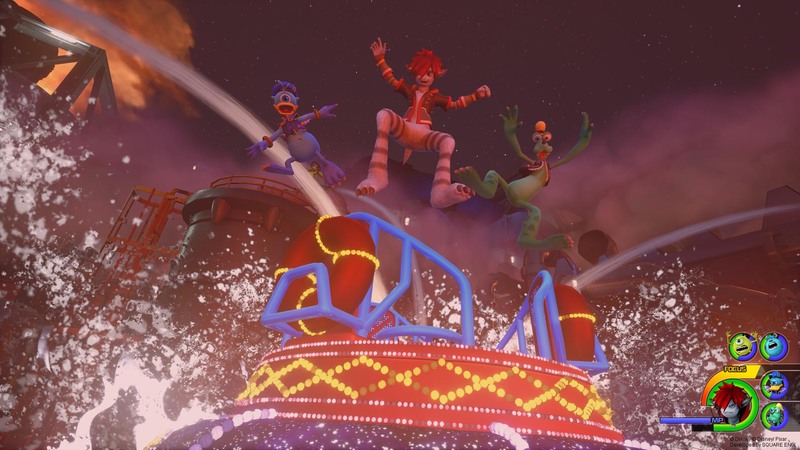 Kingdom Hearts 3 doesn’t take long to take you to your first Disney World, and with each one you visit there’s something truly magical about them. Well… most of them. Toy Box sees you meet up with Woody and Buzz, and though the world is just as spectacular as you’d expect – vibrant and meticulously recreated to look like it’s straight out of the Pixar movies – it’s the added surprises that come with it. In the video game store at the mall, you get to take part in a minigame that sees you blow the holy hell out of an army of mechs, but it’s the Final Fantasy spin on it that makes it so good. The Caribbean is another beautifully crafted world, letting you set sail on the high seas and participating in sea battles akin to the likes seen in Assassin’s Creed: Black Flag. 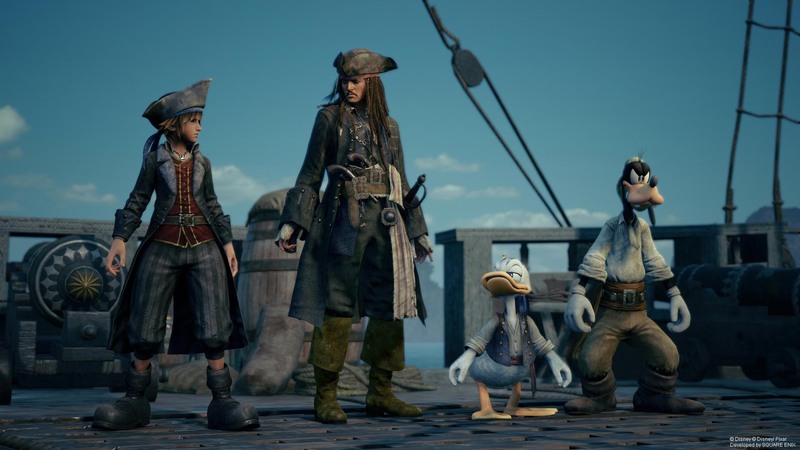 Jack Sparrow and Davy Jones are expertly animated, but it’s what happens to Sora, Donald, and Goofy that shows how much thought has been put into their appearances depending on the world you’re in. Not every Disney World is great, though. Arendelle for example is just a lot of white and grey with little diversity in its design, and Olympus feels restrictively linear compared to some of the others. Regardless, each world offers something different, and when the overarching story seems so baffling at times, it’s the individual worlds that provide some much-needed time away from it. Whilst each Disney world does link to the story, they all have their own. Some happen after the films are set, others are concurrent with that film’s plot, but they all find a way to link Sora into them. Many are done well, such as Big Hero 6 and Toy Story, but Frozen is pretty much the same as the movie, even using up the entirety of Let it Go to fill up your time in Arendelle. What is lovely about each world is how wholesome and good each story is. It is Disney at the end of the day, but it’s that purity that I related to. There’s so much darkness surrounding us these days, and to have moments like Boo’s innocence and laughter flourish as she hugs and plays with Sully made me grateful to experience that kind of virtue. There are times when the voice-acting lets KH3 down, due to some delayed delivery of lines, and odd reactions to simple questioning or statements. 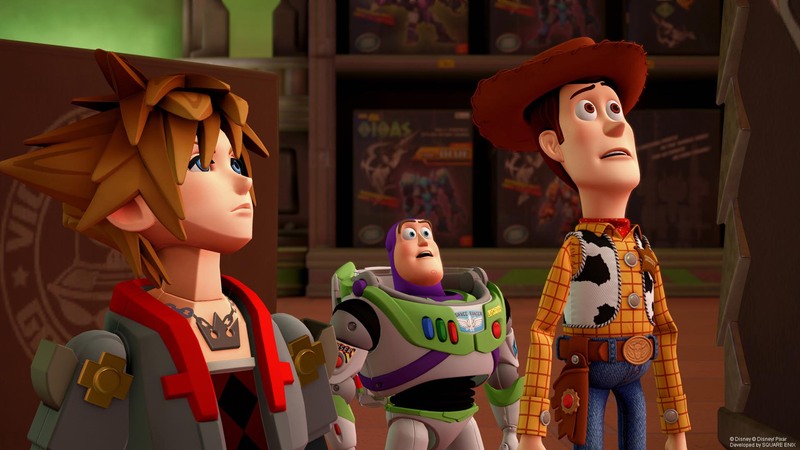 It feels less like Disney and more like Final Fantasy, and for a game based around Final Fantasy I understand, but listening to Woody, Buzz, and Sora without the smooth wit and natural rapport that I’m used to is quite off-putting. When you want a break from the story, there’s plenty to do that doesn’t require battering Xehanort’s minions. After travelling to Twilight Town and meeting up with Remy from Ratatouille, you can go out into the universe and find various foods to create lots of fancy meals to cook at the Bistro. You can collect Mickey Mouse minigames to play on your Gummiphone, go dancing with Rapunzel, fight off pirates in thrilling sea battles, and plenty more. There’s new stuff you unlock towards the end of the game as well, giving you more to do when the story gets a bit too much to take in. At its core, Kingdom Hearts 3 tells the story of friendship, and how love can conquer all regardless of the innumerable obstacles thrown at us in our lives. Even though the main story is outlandish at times, the premise in its most fundamental state tells us we can do anything as long as we have people to share the experience of living with, to help us get by in the darkest of days, and to never give up no matter how impossible our toughest challenges may appear to be. Reflecting on my time with it, I’ll remember the charming cynicism of Donald, the naive positivity of Goofy, and the kindness all of my new friends showed me. It may have been challenging at times, and the final flourish of boss fights nearly killed me, but I did enjoy playing the concluding game in Sora’s journey to vanquish evil once and for all.